What is ingrown hair in the armpit? Do you have bumps under your arms, especially after shaving? When a follicle grows inward rather than outward, it can create an ingrown hair. After you wax or shave, your hair may curl back toward your skin. Raised bumps often form. They are known as underarm razor bumps. When ingrown hair in the underarm becomes infected, it may cause pain or develop into a sore with pus. They hurt because there is naturally a lot of friction in this area. So how do ingrown hairs in the armpit feel? The tips of the follicles are sharp, and they may grow in a sideways direction, causing irritation. We have included some photos to help you identify underarm ingrown hair. What causes ingrown hair in the armpit? Various things may cause your armpit hair to grow inwards, into your skin. Not being careful while you shave is one. So are curly armpit hair and some deodorant types. Cancer can also cause infected ingrown hair. If you get razor bumps when you’re shaving, it’s because the skin of the underarms is quite sensitive. Don’t use blunt or old razors, and remember to shave in the same direction as your underarm hair grows. Abrasive methods of hair removal cause ingrown hair. If you wax your underarm, this needs to be done gently, too. SkinAcea reports that if you pull your hair from the underarm follicles, it can change the direction in which it grows. Rough shaving, epilation and tweezing must be done carefully. If you don’t exfoliate your skin properly, you’re more likely to have ingrown hair in your armpit. Excess oil, along with dirt and dead skin cells may clog your pores and force your hair to grow sideways or inwards towards the skin. Exfoliate the skin under your arms several days after you shave, to help hair follicles in growing straight. Soak the skin with warm water, to help it soften. Apply an antibacterial soap on a clean washcloth. Scrub your underarm VERY gently, particularly where hair was removed and any areas that have bumps. Rinse your skin with warm, clean water – NOT HOT. Apply a high quality moisturizer to the skin. Bikini balm works well for bumps and ingrown hair. When you exfoliate, don’t pull on the skin or cause any damage. That will worsen bumps and won’t get rid of ingrown hair. Tight clothes may obstruct proper hair growth under your arms. In addition, if you scratch your underarms when they’re itchy with razor burn, this can irritate the skin. Some clothing made of nylon or synthetic fabrics cause ingrown armpit hair. People with curly hair, like African Americans or Hispanic people, are more prone to hair growing inward and causing ingrown hair. They usually have more razor bumps when they shave. Razor bumps in your armpit, often in clusters, are a sign of ingrown hair. If you have just shaved an area, you shouldn’t have any papules or pimples growing. If you do have them, this problem may be developing. Keep an eye out for black dots in the middle of any razor bumps. This indicates trapped hair that may begin to grow inward. Do your poor armpits itch or hurt after you shave? Itching can be caused by irritation from old razors, etc., but hair growing sideways indicates ingrown hair follicles. Lymph nodes are found in your armpits. If they swell there, it is usually caused by shaving irritation. Bacterial infection and embedded hairs may cause the lymph nodes to swell. Razor burn and rash are certainly among the first signs of developing ingrown hair. Heat rash resembles razor rash, but in people with sensitive skin, there may be clusters or rash-like bumps under the arms. If you have bumps under your arms with dark centers, these may be embedded hair that isn’t growing properly. They are like pimples in appearance and could form abscesses that fill with fluid. If you don’t treat them, they may become boils. Lumps under your arm feel like swellings in your skin. They can be brought on by infection, swollen lymph nodes and underarm cysts. The U.S. National Library of Medicine cautions that some cysts that recur shouldn’t be ignored, as they may be symptomatic of cancer. But if your hair follicle dies before it is removed from under your arm, this may form a lump caused by embedded hair. If you have any embedded hairs under your arms, they can develop blisters or pus cysts in the armpit. WiseGeek health reports that if you find yellow pus under your arms, it indicates a follicular bacterial infection. Using a mirror, a needle and tweezers, you can pull ingrown hairs out yourself. But if your embedded armpit hair is infected, the symptoms need to be treated before you try to pluck the ingrown hair. Cleanse the armpit skin with a mild cleanser first. This removes any debris and bacteria that could cause infection. Gently steam your underarms. This is done by taking a nice warm bath, or dampening a clean washcloth with warm water before applying it to your armpits for several minutes. This will aid in making your skin more comfortable, and cause the ingrown hair to move closer to the skin surface. If your armpit isn’t infected already, exfoliate the skin first. Then, using a clean needle or pin, pop the bump at the ingrown hair site open and use the embedded hair to open the hole up directly. Using sterilized tweezers, grab the embedded hair and remove the portion that grows into your skin. Don’t remove the entire follicle, or you will cause more irritation and may even cause the development of a boil. Use a little bit of diluted hydrogen peroxide to disinfect the hair follicle. Apply an antibacterial product like Neosporin to clear the infection. Some favorite home remedies include lavender oil, coconut oil, tea tree oil or commercial Doterra oil. These oils will get rid of scars from ingrown hair and reduce infection. In addition to removing ingrown portions of hair, you can use treatments to stop hair follicles from becoming embedded. Listed below are some DIY remedies that can be used to naturally rid your underarms of ingrown hair. They will also help in soothing any irritation you are experiencing. Aspirin helps to reduce any inflammation that occurs after you shave. This aids in preventing armpit hair from becoming ingrown. Just crush several aspirin tablets to make a paste. Apply this to your underarm skin, Leave it on your skin for five minutes and then rinse with warm, clean water. 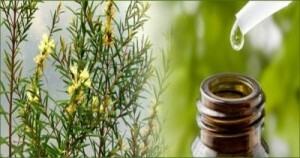 Tea tree oil contains antiseptic, antibacterial and anti-inflammatory properties. It helps to heal ingrown hair in the armpit and reduce any infections. Tea tree oil helps treat ingrown hair. Use water to dilute several drops of essential tea tree oil. Apply this mixture on the armpit skin. Leave it on the skin for 10 minutes. Then rinse with clean, warm water. Repeat this process again, to help in ridding your underarms of ingrown hair. Why are black tea bags helpful in soothing underarm inflammation brought on by razor bumps and burns? It’s due to the fact that they contain tannic acid, which is a natural anti-inflammatory that soothes armpit skin where you have ingrown hair. Use tea bags to treat inflammation quickly. Use 1% hydrocortisone cream, which is a topical steroid cream. It will prove helpful in reducing inflammation of your underarm skin after you shave or due to embedded or ingrown hairs. This type of cream also reduces underarm scarring from shaving bumps or embedded hair. These are both treatments for acne, but that makes them quite effective in treating and reducing ingrown hair. Salicylic acid is especially valuable for exfoliating your skin, which allows any trapped hairs to force their way up through your skin more easily. In addition to salicylic acid and benzoyl peroxide, you might also try glycolic acid.